Intel AMT / vPro KVM without proprietary RealVNC Viewer Plus | Michael Hirsch, Ph.D.
On your laptop Download and install the free, open-source Intel Mesh Commander. 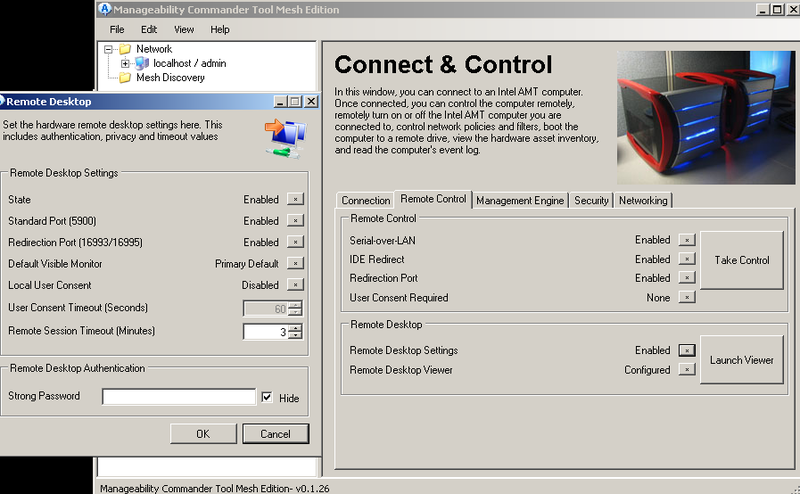 Open the “Manageability Commander Tool” and click File → Add → Add Intel AMT computer and type the IP address and vPro username (typically “admin”) and password. Set the password in the remote PC BIOS if you haven’t already. Click the little plus sign by Network and click on your AMT PC’s name–then in the Connection tab, click Connect. This will take about 5-10 seconds to connect–if Unsuccessful, the button will fall back to saying Connect. If successful, the button will change to say Disconnect. Go to the Remote Control tab and wait about 10 seconds for the “remote desktop” items to change from “unknown” to the actual state. If Remote Desktop Settings is “Disabled”, click the little box to its right to open a new window. Change the settings to look as follows–note, for Strong Password, it must be exactly 8 characters, including at least one number, one symbol, and one capital letter. Actually that’s a pretty weak password, but it’s all Intel allows. Click OK and then go back to the Connection tab and click Disconnect. Don’t mess around with any of the other settings unless you know exactly what you’re doing and are willing to drive out to the remote PC to fix it if you mess something up! Close the MeshCommander program. Now you should be able to connect using a standard VNC program. We use “localhost” since I SSH into the remote PC first. The Cygwin SSH server is highly robust for secure SSH port forwarding. Please use SSH ED25519 public key authentication as it is vastly more secure than keyboard passwords. Intel MeshCommander replaces Intel Open Manageability Toolkit.